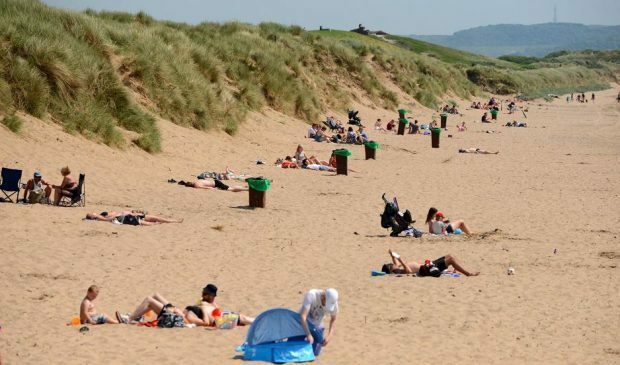 Weather across the north and north-east of Scotland could soar to as high as 25C today as the country is gripped by a heatwave. Local enjoyed blue skies across Aberdeen city and shire, Moray and parts of the Highlands as the mercury soared yesterday – and the sunshine is expected to continue today. However the Met Office has warned this could be broken up with spells of “heavy showers” of rain. Some parts of the Highlands, including Inverness, could even experience thunder. The forecaster has placed a yellow warning on the Highlands, warning of “torrential downpours” and flash floods in central parts of the region. Parts of the north-east may get rain, however temperatures will still remain high all day with Braemar expected to reach 25C. Yesterday parts of Scotland were hotter than Barcelona – with a high of 27.3C recorded in Bishopton, Glasgow. Temperatures in Braemar reached a high of 24.1C, whilst in Aviemore it was 23.5C. Temperatures reached 16C in Aberdeen, although Peterhead did not surpass 12C – with Bervie a chilly 10C. Last night the Met Office said it would “not rule out” highs of 25C in the Braemar area and other parts of western Aberdeenshire and the Highlands today. Yesterday Met Office meteorologist, Alex Burkhill, said the temperatures both yesterday and today were “quite a few degrees above average for this time of year”. He added: “There is a good deal of fine, sunny weather and it will be pretty warm. You don’t have to travel far west even for these sunny conditions. “I think on Tuesday the weather is going to be similar, you will perhaps get a better chance of reaching 25C. The further east you get, the colder the conditions. Mr Burkhill said that “stagnant air around Scotland” had caused the heatwave. He added: “The sun is generally strong at this time of year. It allows everything to heat up quite nicely. “The weather warnings for tomorrow might just about slip western parts of the region. Showers are a bit more widespread.